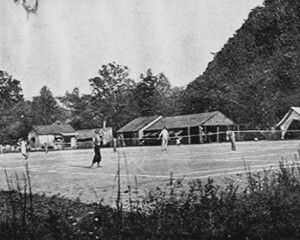 The town of Alderson, West Virginia is the home of Camp Greenbrier, a summer camp for boys, located on about thirty-five acres of land on the river just east of the town limits. Alderson can be found about 30 miles west of the world famous Greenbrier Resort. Outdoor camping for health and education of youth is a peculiarly American institution. No other country has organized outdoor camping or camps to such an extent as the United States. Camp Greenbrier was established in 1898 and is the oldest privately owned summer camp in the United States. Camp Greenbrier had a distinguished group of men who started the camp and, over the long period of years, men of great scholarship and leadership have been on the staff. Dr. Walter Hullihen, Ph. D., a college professor at Grant College, Chattanooga, Tennessee, later with the University of the South, and Horace Whitman, a distinguished lawyer living in Baltimore, met at Johns-Hopkins University. These two men and other men camped up and down the Greenbrier in 1895, 1896 and 1897, searching for a camp site to start an educational and athletic camp for boys. They settled on Alderson. The prestige of the staff and the location of the camp attracted a substantial clientele. Until the mid-1920’s, the camp had a compulsory academic program taught in Walker Hall, now demolished, with Greek, German, French, English, Geometry, Algebra, Trigonometry, Analytical Geometry, History, Physics, and Chemistry. The qualiﬁcations of the staff were impressive. Most of them held Ph. D or Master’s degrees, and none less than a Bachelor’s degree. Classes were held during the morning and teaching was intensive. The purpose was to help boys advance academically or, in some cases, help them in make-up. In addition to distinguished staff members who have been connected with Camp Greenbrier over the years, a number of outstanding men have been campers. lvan Allen, Mayor of Atlanta, was at Camp Greenbrier for ﬁve years. Bill Wade, quarterback of the World’s Champion Chicago Bears, was at the Camp for twelve years. Many others have distinguished themselves in their professions. The athletic program was diverse. Baseball, tennis, swimming, canoeing, every kind of track event, marksmanship, trap shooting, and hiking were some of the sports. The baseball team played Alderson, Hinton, Ronceverte, Lewisburg, Covington, and Hot Springs. Some of those old baseball games must have been exciting. In some seasons, Alderson met the camp in ﬁve games. Before 1917 Dr. Hullihen specialized in trap shooting, and then the long rifle range was started. For a time, the Camp had a 600-yard range and a 200-yard range. Springﬁeld 30 caliber riﬂes were used. The U.S. Government always furnished the ammunition for the ranges. Camp Greenbrier still uses, for athletic purposes, a track built in 1884 for horse races. It was built by the Greenbrier County Industrial Exposition, known simply as the Alderson Fair. The Fair was one of the precursors to the State Fair of West Virginia which is located about 15 miles from Greenbrier today. Dr. Hullihen owned Camp Greenbrier outright until 1921 when he became President of the University of Delaware. Camp Greenbrier was then incorporated, but Dr. Hullihen owned a majority of stock. He brought in Dr. Frank Hooper, John S. Walker, C. B. Richmond, and Frank Carter. All of these men were from various universities or schools, and were minority stockholders. 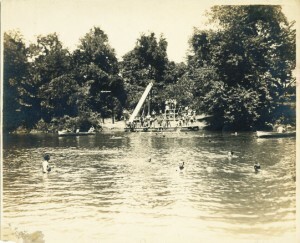 From 1917 until about 1925 Camp Greenbrier was a military camp – not a part of the U.S. Army. The campers had uniforms, regular drills, and a good band. Older town residents remembered the camp boys and band marching on occasions in Alderson. In 1944, Dr. Hullihen died and his two daughters inherited his interest. Until 1947 Frank Carter operated the camp as Director. The Hullihen daughters sold their interest to Theodore S. Garnett, S. Cooper Dawson, and Evan J. Male prior to the 1948 summer. Within a decade, Mr. Garnett and his wife Kitty were the sole owners of Greenbrier. Their daughter, Maria Garnett Hood, and her husband Bob took over in 1974. In 1997, Maria’s son, Will Harvie, became the Director and continues to run the camp alongside his wife Lenka. *Kenneth D. Swope is credited with writing much of the foregoing history of Camp Greenbrier.